Thanksgiving dinner would not be complete without the stuffing. Whether you are stuffing your foul or serving the moist bread mixture alongside your bird, making your own stuffing for the holidays is easier than you think. In this recipe we cut up old cornbread into small cubes, but any day old bread will do. Simply cube your bread, spread on a cookie sheet, and bake at 225°F until crisp and dry. 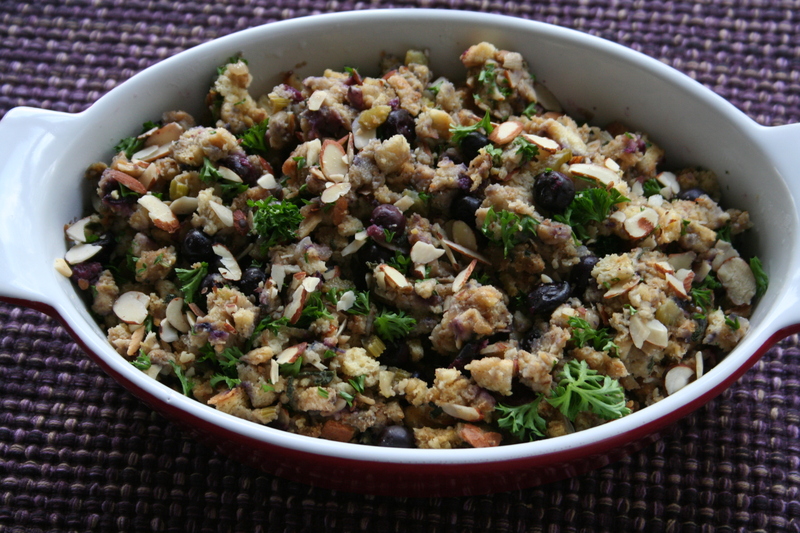 Dried fruits and nuts are naturals for stuffing. Luckily, blueberries can be found throughout Southern California year-round, but frozen work just as well. Plump blueberries bursting with warm, sweet juices and toasted almonds mingle well with the aromatic herbs and mirepoix. So this holiday season, Stuff, don’t stress. 1. Preheat your oven to 325°F. Grease a 3-4 quart casserole dish. 2. In a large skillet, melt the butter over medium heat. Wait for butter to brown. It should begin to smell a nutty. About 5 minutes but watch closely. 3. Once it browns, quickly (and carefully) add the onions, celery, garlic, sage, and thyme. Allow to sauté, stirring occasionally until the vegetables soften. About 8-10 minutes. 4. Stir in the toasted cubed cornbread. Stir to combine. 5. Drizzle in the stock to moisten the cornbread. Mix thoroughly. 6. Spoon out the stuffing into your prepared casserole dish and cover with foil. Bake for 20 minutes covered. Remove the foil and bake another 10 minutes or until the top becomes golden and crispy. Note: Stuffing freezes beautifully. Make sure you allow the stuffing to cool completely before freezing. If your stuffing is dry, simply reheat and add more stock. LatinoFoodie thanks you in advance for sharing this recipe with your friends and family and leaving a comment below. Happy Thanksgiving!